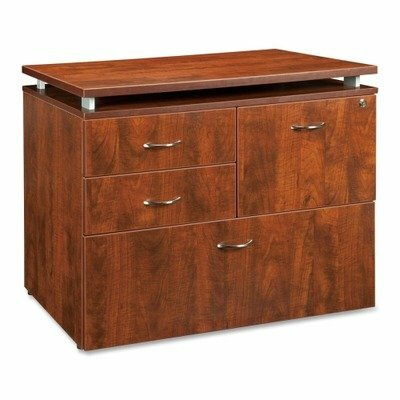 Four-drawer file is part of the Lorell Ascent Series Laminate Furniture and adds versatile storage options to your office configuration. Cherry laminate top and side panels are 1" thick for durability as well as stain-resistant and scratch-resistant. The top is supported by aluminum brackets to provide the floating top look. File features two box drawers, one file drawer and one lateral file drawer. File drawers accommodate both letter-size and legal-size files with the included hangrails. Drawers fully extend and roll smoothly on steel ball-bearing suspension. Design also includes central locking, 3mm PVC edges (color-matched) and adjustable floor glides for stabilization.